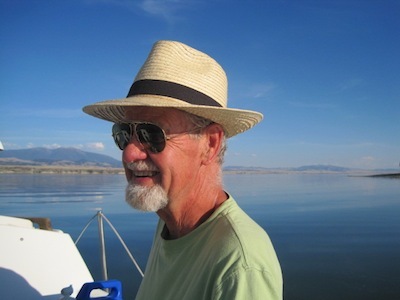 Roger Dunsmore taught Humanities, Wilderness Studies, and American Indian Literature at the University of Montana (Missoula & Dillon) from 1963-2013. He trained teachers for the largest Indian high school in the U.S. on the Navaho Reservation, 1988-89, and was faculty exchange fellow between UM and Shanghai International Studies University in 1991 & 97. Earth’s Mind: Essays in Native Literature was published by U of New Mexico Press, 1997. Blood House, his second volume of poems, 1987, was selected by the Yellowstone Arts Center, Billings, for their Regional Writer’s Project “to promote fine writing about the American West.” His China poems, Tiger Hill, was awarded an Individual Artists Fellowship from the Montana Arts Council in 2001. Humanities Montana selected him as one of their Humanities Heroes in 2012. His fifth volume of poetry, On the Chinese Wall: New & Selected Poems, 1966-2018 was published by Drumlummon Institute of Helena, Mt. last September: (Here, among echoes of Archilochos and Meister Eckhart, can be found a poem for a loose ram, a poem for a woman kissing all the icons in the Byzantine Museum in Athens, a poem for a trapper in Montana whose pet wolverine loved Oreo cookies, and a man named Mike Blue Horse, ‘best night-hawker on the Hi-line,’ dancing solo in a bar in Montana.) Dunsmore has been short-listed to the governor for the position of Montana Poet Laureate twice, 2005 & 2007. Currently, He is beginning his sixth year of staple-gunning the work of other poets monthly to utility poles and in small businesses in his Coeur d’Alene neighborhood.